Erik Woods, Kristen Romanelli (Film Score Monthly Online) and Christopher Coleman tackle six hot-topics from the world of soundtracks. 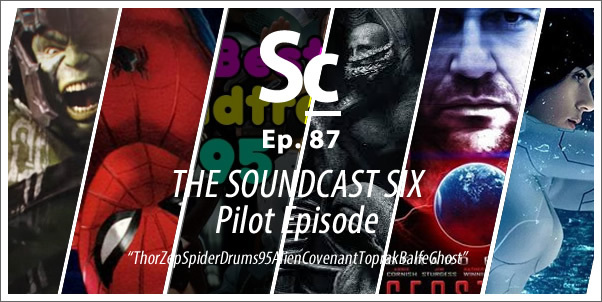 In this soundcast-experiment, they talk about: the inclusion of Led Zeppelin in the recent "Thor: Ragnarok" trailer, Michael Giacchino's drum-teasy-video from the "Spider-Man Homecoming" recording session, Spin Magazines 2015 article listing their Top 30 Soundtracks from 1995, the recently "leaked" track "Alien: Covenant Theme" on Soundcloud, the replacement of composer Pinar Toprak on the upcoming film, "Geostorm" and the disappearing original score release for "Ghost in the Shell." This is a pilot episode, so your feedback is the key to seeing more episodes like this! Please, let us know what you think! 19:16 - #3 - The "Best" of 1995? 30:09 - #4 - Alien: Covenant theme?